SHANKSVILLE — If a picture’s worth a thousand words, Val McClatchey’s is the Da Vinci Code. 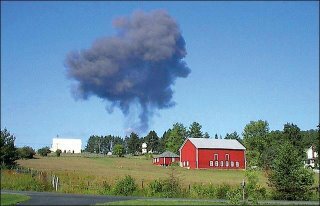 Her photograph of a mushroom cloud of gray smoke rising above the bucolic countryside – snapped just moments after the crash of Flight 93 – has become a target for 9/11 conspiracy theorists. Five years later, the 50-year-old Indian Lake woman is frustrated by allegations the photo is a masterful hoax. McClatchey said she ran a short distance to the door, saw smoke and instinctively grabbed her month-old digital camera from nearby. This article contains a revealing photo. The bottom photo is a current photo of Val McClatchey apparently clutching her then month-old digital camera that she supposedly used to take her infamous plume photo with. It was presumably taken from the Tribune-Democrat reporter doing the story. Just look at and compare the color quality of both photos. Look how dramatically different the colors are between them! The reporter's photo, to me, looks like a real photo. However, Val's photo looks like it's colors have been manipulated which then adds evidence that her photo was faked. Also, notice in the reporter's photo that there is a small white cloud barely over the horizon above the red barn. Notice the horizon is higher than her house and from what I've been told, the crash spot sits lower in elevation than Val's house. If that white cloud is hovering near the crash spot, then just imagine how tall the plume in Val's photo would be! One more thing to point out, if you look at the thin column of smoke under the round part of the plume in Val's photo, notice on the lower left side of the smoke column just above the tree line that there looks like there is also a small white cloud and it appears to be behind the plume. If this small white cloud were in fact hovering near the crash spot, this would make the height of the plume practically a mile high! It also gives more evidence that the plume was photoshopped on there because it seems way too tall and wide to have come from the crash spot and it is starting to look like it is even way too tall and wide to have even come from just beyond the horizon!